Providing you the best range of earth rods, copper bonded rods, copper grounding rods, electrical earthing electrodes, copper bonded electrodes solution and copper bonded grounding rod with effective & timely delivery. Earth rods are usually made of solid copper or stainless steel with copper bonding. Copper Bonded Earthing Rods or Copper Bonded Grounding Rods are commonly used due to its remarkble tensile strength, anti-corrosive nature and comparatively low cost. Our Copper Bonded Earth Rod System includes Clamps & Coupling, Driving stud etc. Usage/Application Earthing of subtations, Power stations, Electrical Insallations etc. 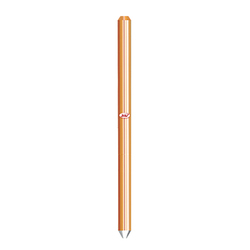 We are the leading manufacturer, supplier and exporter of Copper bonded rods in India. These are manufactured by high grade raw material and state of the art technology. We are an ISO 9001:2008 certified company involved in manufacturing, supply and export fo high quality Copper Grounding Rods. These are used in various industries for earthing and grounding purpose. These rods are molecularly bonded with 99.99% pure Electrolytic Grade Copper (CU) over a low carbon tensile steel rod, with the thickness of 250 micron copper coating. 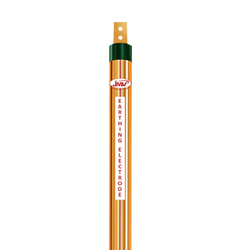 We are one of the India's largest manufacturer and exporter of Earthing Electrodes, an ideal choice for extremely successful grounding. The range of electrodes oscillate between different materials: GI, Copper, Copper Bonded etc. 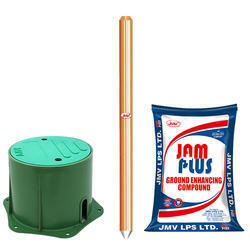 Copper Bonded Electrodes offered by JMV mark complete solution of earthing that is manufactured by state of the art technology and good quality raw material to have comparatively long shelf life and good results. The earthing system inherent copper coating of relevant thickness and provisions can be customized as per the client's requirement. JMV is India's one the leading manufacturer and exporter of Copper Clad Rods an ideal choice for extremely successful grounding. Our Copper Clad Steel Rods are molecularly bonded to low carbon steel rod by 99.9% electrolytic grade copper. Our Rods comes with a minimum thickness of 254 microns (0. 254 mm) thus ensures excellent corrosion resistance and eliminates the chance of getting oxidized. Coupling threads are formed by a Cold rolling process that provides thread strength hence maintain the integrity of the rod. Being a manufacturer apart from our standard sizes we also provide customization as our client's specification. We are the manufacturer of Copper Bonded Grounding Rods based on globally accepted technology. It is made up of high grade stainless steel with copper coating of 99.9% pure copper which helps in dissipating the fault current to help your assets being damaged from the hazards of fault current. We are the manufacturer, exporter and supplier of Copper Earthing Rods in Delhi and NCR, India. These offer low maintenance and offer robust construction. Looking for Ground Rods ?